Let’s face it: the vast majority of notes from 1976 to present, including the famous bicentennial $2 bill issue, don’t have much collector value. Most of the time, one might come across these notes at the bank, ATM, or in grocery store change. At first, the usual reaction is, “Eureka! this beat up 1981 non-star $5 bill has to be worth hundreds of dollars!” Sorry, no dice. Even in uncirculated condition, you’d be lucky to get $10 from a dealer for it. When it comes to ultra-modern notes, one must be a little more discerning to know what is truly CURRENTLY worth collecting. Suppose you have a 1996 $100 bill star note (first series of redesigned notes). Not bad, a cool find for sure, especially in uncirculated condition. One day, a dealer posts 10 packs of 1996 $100 star notes for sale on eBay.com. He probably picked these up at his local bank, since it is highly likely many banks still have these notes lying around. Each pack was acquired at face value for $10,000 (100 notes per pack) x 10 packs = $100,000. Wow, quite an investment! Now the dealer turns around and offers each pack for $12,000, or single notes for $150 each. They’re all Gem Unc. so the price point is warranted. It’s an incredible way to get a 20% or greater return on a $100,000 investment, which these days is quite impressive given that most people get pennies on the dollar in their savings or investment accounts. Suddenly, your own 1996 $100 star note isn’t quite as valuable. 1000 new notes just hit the market, and that will put a dent in the value for the short run. Even better for the dealer, he has plenty of room to haggle with customers and could easily sell the notes for $110 each and still turn a nice 10% profit. Remember, there are no “note supply controls” in the currency world except for how major dealers manage their inventories. As a result, the value of ultra-modern notes can be particularly volatile and unpredictable. So how does one figure out what is worth collecting? Remember one word: RARITY. What makes an ultra-modern note rare? Here is a short list of factors that contribute to rarity and value. Notes with multiple rarity-creating factors will not only be valuable now, but continue to be valuable for years to come, making them great investment vehicles. Star Note – Star notes contain a star at the end of their serial number instead of a letter. Star notes are produced as replacements for notes returned to the B.E.P. that can no longer sustain circulation. Additionally, these notes are printed as replacements for notes with specific serial numbers that the government purposely removes from general circulation, ie. serial X00000002X. As a result, star notes are instant rarities because they are produced in vastly smaller quantities than normal notes. Anytime a note comes from a “minority population” opposed to what’s in general circulation, it commands a higher value. Error Note – Despite all the latest improvements in the currency printing process, there are inevitably notes that escape the B.E.P. with minor to dramatic errors. Ink smears, genuine cutting errors, stuck digits, missing impressions, and other deviations are examples of error notes that people will readily collect. If your series 2003 $10 note (big head) has Hamilton in a blindfold from from an ink smear, chances are you can get significantly more than face value for your bill. Anything that is not doctored and a genuine B.E.P. printing error is highly collectible. 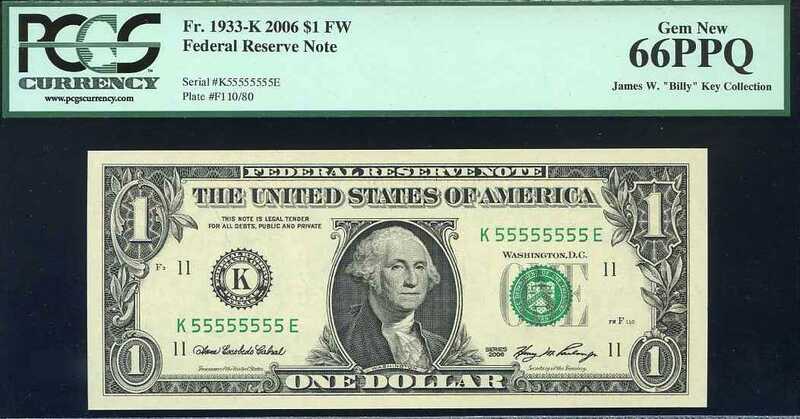 Fancy Serial Number – Notes with special serial numbers are – and most likely always will be – highly collectible, simply because a serial number makes each note unique. Therefore, if you find a 2004A $20 colorized big head note with serial number BB00000010A, you’ve got a neat find on your hands. Fancy serial number dealers will happily make an offer on your note. Also, serial numbers with interesting patterns and combinations of numbers are desirable. The following table lists some examples. Remember, “almost” only counts in horseshoes. If your note is a few digits short of a perfect set of 8 7s, for example, it may not have any value at all, opposed to a note with a solid 7s across the entire serial number, which IS very valuable. Low Production Numbers – Naturally, notes from a specific issue or Federal Reserve bank that were produced in dramatically smaller numbers command a premium over face value. In order to know production numbers, we recommend purchasing the Standard Guide to Small-Size U.S. Paper Money 1928 to Date by Schwartz and Lindquist, available from Krause Publications. This book can be found secondhand on eBay or for purchase at Amazon.com. Read up on production numbers from the B.E.P. for notes produced in the last 20 years to get an idea of which notes are truly rarer compared to others. For example, 1985 $100 Star Notes from the Cleveland or Kansas City district are much rarer than regular notes from other districts, simply because the B.E.P. only produced 1,280,000 star notes for each district. Schwartz and Lindquist assign a value of $350 to an uncirculated Cleveland or Kansas City 1985 $100 star note, compared to just $150 for a non-star note from any other district. Hurry up and check your billfolds, you might have treasure waiting to be discovered in your pockets! Anyone interested in purchasing the notes listed above should contact USARare.com directly by visiting their website, www.usarare.com. We’re off this week due to travel, but wanted to wish all website visitors a happy, safe, and healthy July 4th holiday. Here’s an interesting tidbit about United States Currency: ALL but the Third Issue of Fractional Currency (including first issue “Postage Stamp Currency”) were issued beginning in the month of July! In fact, the Second Issue hit the presses just a week after the July 4th, 1863 holiday! (Notes from the Second Issue starting running July 11). So despite the dog days of summer, the B.E.P., or more accurately it’s predecessor the National Currency Bureau, were quite busy during the summer months of the Civil War era cranking out paper money for the nation to use. Clearly, the dramatic shortage in metal caused by increased ammo production for the Union army greatly impacted the nation’s coin supply. Make sure to keep your currency collection away from the heat and BBQ sauce, even if you just HAVE to show off your favorite summer purchases to friends and family!